Despite the blow to his career from putting a few too many holes, and an underwhelming performance after returning to golf, the Tiger Woods name still holds a prestigious position in the sports video game industry. Tiger Woods PGA Tour 12: The Masters, while putting less emphasis on the Tiger Woods name, was still a critically acclaimed release that continued to uphold its reputation with innovations and improvements to the franchise. One such improvement to the Tiger Woods PGA Tour formula was the enhancement and expansion of the PlayStation Move support from the previous iteration in the series. Because of this, EA Sports and Sony are releasing a limited edition Tiger Woods PGA Tour 12: The Masters Move bundle for both newcomers to the franchise and the PlayStation Move motion control system. The bundle comes complete with the game, the PlayStation Eye USB camera, and the PlayStation Move motion controller for $99.99. Unlike some of the previous limited edition Move bundles, this bundle will be available at all retailers rather than being exclusive to just one. While the game has been out for a little over three months now, this bundle is perfect for those who have yet to dive into the PlayStation Move experience and are planning on purchasing the golfing simulator. However, for those who already own the PlayStation Move device, the game itself is available for a low price as well. 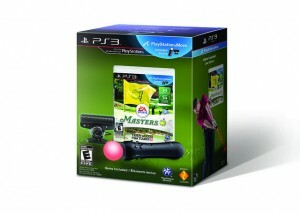 Preorder the Tiger Woods PGA Tour 12 Move bundle here or simply purchase the game, itself, here. The Move bundle hits store shelves next week, July 12, 2011.